Lumding Glacier, Nepal terminates in Lumding Tsho, a proglacial lake, in Dudh Khosi Valley in the Mount Everest region of Nepal. This lake poses a hazard for a glacier lake outburst flood n the Dudh Khosi valley. The lake expansion results from retreat of the Lumding Glacier.Bajracharya et al (2008) in a International Centre for Integrated Mountain Development (ICIMOD) study examined the changes in Lumding Tsho from 1962-2000 and found the lake grew from 0.2 km2 in 1962 to 0.77 km2 in 2000. 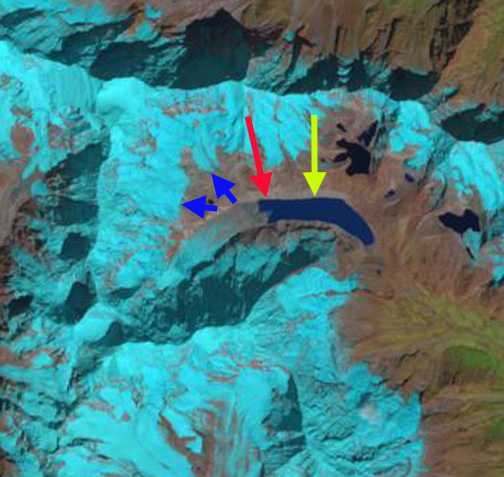 ICIMOD has an ongoing specific focus on assessing glacier lake outburst flood potential. This was the result of a retreat of 40 meters/year from 1976-2000 and 35 meters/year from 1962-2007, as noted in figure below from Bajracharya et al 2008). Here we update the changes to 2013 using Landsat imagery. This would lead to a lake length increase of about 800 m. The lake was 625 meter long and had an area of 0.1 km2, by 2007 the lake was 2180 meters long with an area of 0.9 km2 (Bajracharya et al 2008)Here we look at a 1992, 2009 and 2013 Landsat image and 2008 Google Earth imagery. The lake begins at the end of the heavily debris covered Lumding Glacier. Yellow arrow on each Landsat image indicates 1992 terminus and red arrow 2009 terminus location. The lake was 1675 meters long in 1992, 2325 meters long in 2009 and 2500 meters in 2013. This represents a retreat of 40 meters/year. The lake at 2.5 km in length now has an area of over 1 square kilometer. 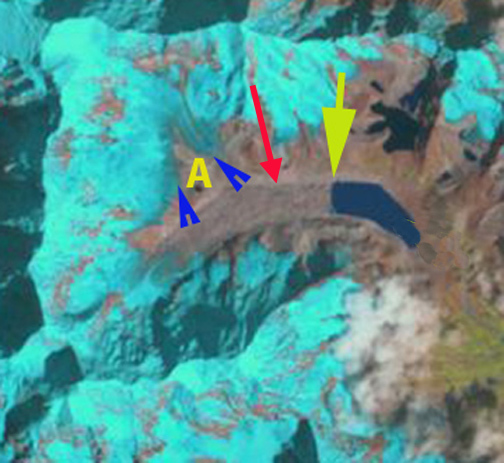 The glacier is fed largely by avalanching off the flanks of, blue arrows. 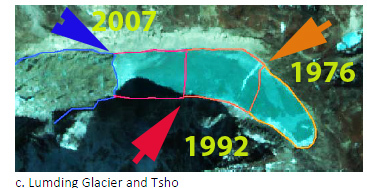 The larger problem for the glacier in the future is the retreat of the terminus of the tributary glaciers that avalanche onto the lower Lumding Glacier. 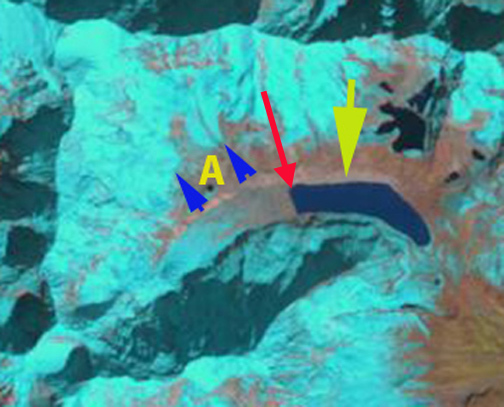 The blue arrows around the letter A in the Landsat images indicate the retreat of these feeder glaciers. The retreat of the two noted in the Landsat images has been approximately 300 meters. 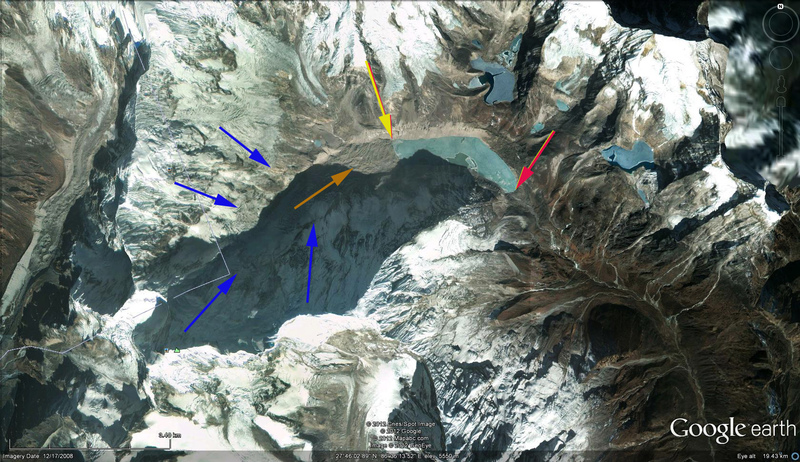 The lower section of the Lumding Glacier is heavily debris covered, brown arrow in Google Earth image, which insulates the underlying ice, reducing melting and retreat. This also indicates the avalanche source of much of the accumulating snow and ice. The increased distance to the feeding snow and ice slopes will reduce this input. The Lumding Glacier retreat is similar to the retreat of nearby Menlung Glacier, Tibet, Imja Glacier, Nepal and North Lhonak Glacier, Sikkim each retreating continually leading to lake expansion. This also fits with the general area extent losses and retreat that dominate the high mountains of central Asia. This entry was posted in Glacier Observations and tagged dudh khosi glacier retreat, lumdin glacier, lumding glacier lake, lumding glacier retreat, lumding tsho expansion. Bookmark the permalink.